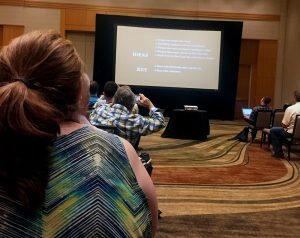 “I come to you from the failing New York Times” – Nikole Hannah-Jones, the 41st annual Investigative Reporters & Editors Conference, Marriott Phoenix Desert Ridge, Arizona. Nikole Hannah-Jones. Picture by Kadia Goba. 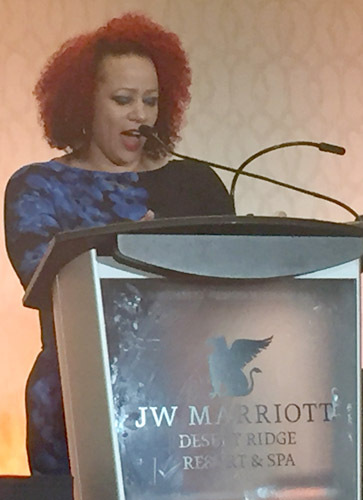 That was the fiery opening of the keynote address by the Times’ award-winning journalist who covers racial injustice and has received several awards for her work in school segregation. “One can even look around this room and understand that in investigative reporting, the most critical of reporting, the lack of diversity is glaring and should be shameful,” said Hannah-Jones, a George Polk Award recipient. She offered a revolutionary way to combat the disparity: “Just hire people of color.” Her called to newsrooms to emulate the racial diversity of the country provoked a standing ovation. As founder of the Ida B. Wells Foundation, the journalist works continuously to confront racial inequality in journalism. increase the ranks, retention and profile of reporters and editors of color in the field of investigative reporting. The IRE conference featured hour-long seminars that plumbed the depths of investigative research. Provocative titles like “Revenge: When journalists become the target” and “Watchdogging Weed” required some of the 1600 attendees to leapfrog from lecture to lecture, ingesting tips, data and methodology during the five-day informational mixer while others took in eight-hour workshops on Excel featuring “Hands On” tutorials from sorting to pivoting tables. From June 21 – 25 reporters and editors from around the world met with industry veterans and hopefuls all with the common goal to add to their investigative tool box. Many novices in the group took advantage of mentoring sessions. Some networks and publications sponsored information booths, while Barry Nash & Co, a broadcast coaching service, provided free 20-minute critiquing sessions. Columbia University and the City University of New York grad J-schools held cocktail hours for alumni and promising undergraduates. All enjoyed the swag bag freebies filled with those hard-to-find reporter pads, luggage tags and other goodies. IRE veterans and Pulitzer Prize winning Mike Rezendes and Walter “Robby” Robinson also delivered commanding performances. The iconic duo of The Boston Globe uncovered the systemic scandal and suppression of child molestation by priesst in the local Catholic Archdiocese. Their work was memorialized in the 2015 film SPOTLIGHT, starring Mark Ruffalo and Michael Keaton. Pointedly, the duo performed a parody of the SPOTLIGHT performances of Ruffalo’s and Keaton’s portrayal of them. Those unable to attend the conference can still benefit from the data-comprehensive seminars by becoming a member and downloading tip sheets from the IRE website. The cheat sheets on accessing Facebook and Twitter data to secrets on executing Freedom of Information Act (FOIA) requests are valuable to reporters at at any level. Senior Editor Kadia Goba, who was awarded a Columbia Journalism School Student Fellowship to the 2017 Investigators & Reporters Conference, can be reached at Kadia.Goba09@myhunter.cuny.edu.